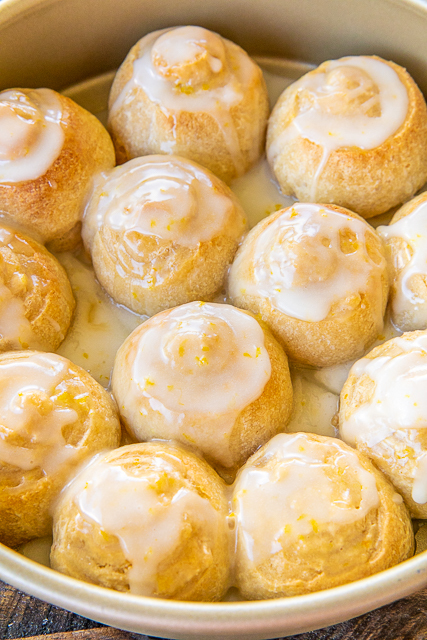 These Easy Lemon Rolls are one of my favorite quick breakfast treats. They only take a few minutes to whip together and they taste great!!! Chicken Legs and I can finish off the whole batch ourselves on a good Saturday morning. Oops! 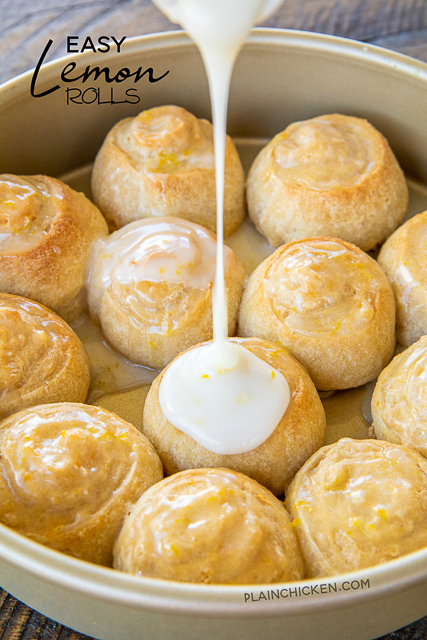 The dough for these Easy Lemon Rolls is a can of refrigerated French bread dough. Just unroll it and slather the filling all over the unrolled dough, roll up and bake. 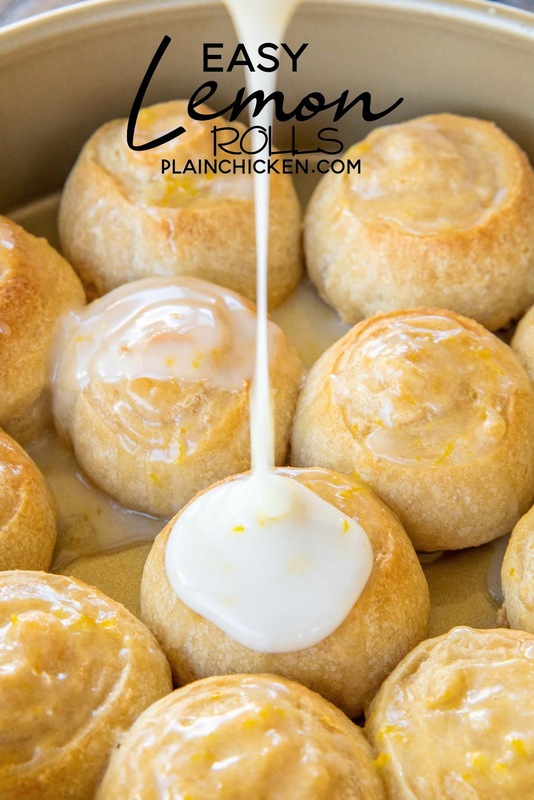 I topped the rolls with a lemon glaze and lemon zest for lots of extra lemon flavor. 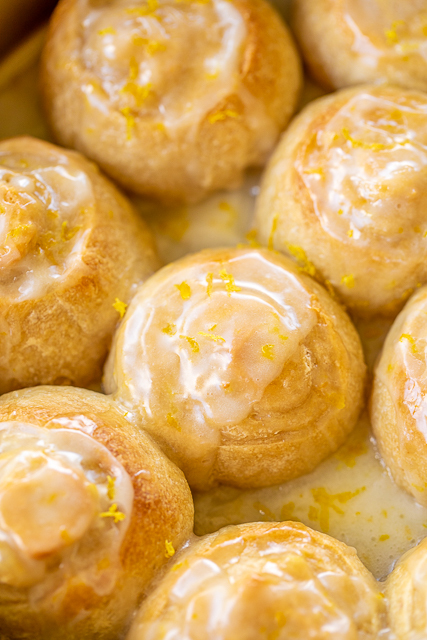 We like to eat these Easy Lemon Rolls for breakfast, but they are also delightful for dessert or with your afternoon coffee. Preheat oven to 375ºF. Lightly spray a 9-inch cake pan with cooking spray. Beat cream cheese, brown sugar, and lemon zest at medium speed with an electric mixer until smooth. Unroll French bread dough. Spread cream cheese mixture over dough, leaving a 1/4-inch border. Sprinkle granulated sugar over cream cheese. Starting with one long edge, roll the dough into a log the long way. Pinch the edges to seal. With a serrated knife, cut dough into 12 rolls. Place in cake pan. Bake for 25 to 30 minutes. Remove from oven. Combine powdered sugar and lemon juice. Spread over rolls. Sounds good and very easy preparation. i'm requesting these for breakfast next week! ;-) yum! Very good. I didn't have a knife so I used the dental floss trick. Will be making these instead of cinnamon rolls for awhile!